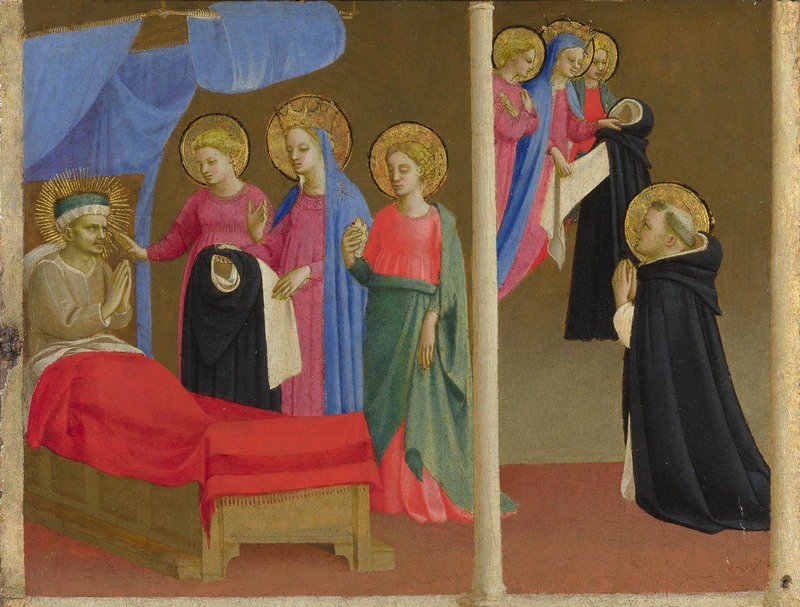 The Vision of the Dominican Habit has received only summary attention from students of Fra Angelico's work: most of them assign it to the master's workshop and one author attributes it to Battista di Biagio Sanguigni. (*4) Most negative opinions of the painting, however, are based on its abraded condition. There can be little doubt either from the complex organization of the composition, which unfolds in a continuous interior space viewed obliquely from the left, or from the sophistication of the representational details, such as the folds of the scapular as it falls from theVirgin's hand, the pull of the bed curtains on their rings, the somewhat casual disarray of Reginald's bed linens, or the shadows cast by the bed itself, that this is a fully autograph painting by Angelico. It remains only to determine the panel's function and approximate date. Although most scholars assume the work to be from the mid - to late 1430s,(*5) the reductive simplicity of its setting is typical of only a brief moment in Angelico's career: close to the time that he executed the Franciscan altarpiece (about 1428-29) and certainly before he painted the predella to the Louvre Coronation of the Virgin altarpiece in the early 1430s. The format of the London panel has led to the general assumption that it was once part of the predella of an altarpiece. (*6) The vertical wood grain of its support, the original painted geometric pattern on the reverse, and the remains of a wire hinge on its left edge, however, indicate that it did not belong to a predella but, rather, to a cupboard door or the wing of a folding triptych. In the latter case, given the placement of the hinge and the discontinuity of the geometric pattern at the top of the panel, the London scene would have been positioned at the bottom of the right wing of the triptych, with at least one, but — in view of its proportions — probably two other scenes above it. There is no certainty, of course, that an additional episode from the legend of Saint Dominic was situated above the London panel rather than a Crucifixion or another Christological subject, but since the Vision of the Dominican Habit is among the earliest events in the saint's biography, and one infrequently represented except in the context of an extended hagiographical cycle, the strongest probability is that the structure of which it formed part was dedicated entirely to the life and miracles of Saint Dominic or to the early history of the Dominican order. 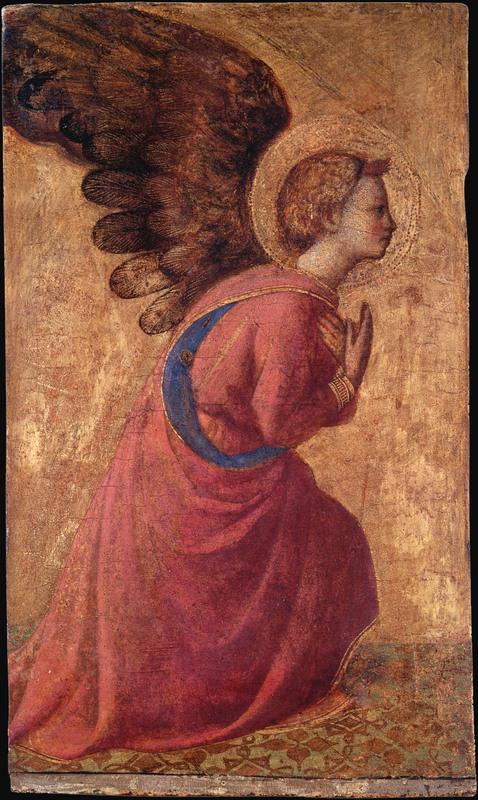 As was common practice on Florentine tabernacles, the triptych's wings are likely to have terminated in pinnacles containing figures of the Annunciatory Angel and the Virgin Annunciate: specifically, the two panels — C and D — now in the Alte Pinakothek, Munich. The exceptional width of the London panel relative to other works that served the same function (see, for example, cat. 16) implies that the complex to which it belonged was unusually large. This is true of the Munich pinnacles as well, which even in their present fragmentary state are wider and significantly taller than other, similar panels by Angelico. Reconstructing their probable original size by completing the truncated arc at their top and inner edges, and allowing for the cropping of the figures along their straight, outer edges as well, results in panels approximately 37 to 38 centimeters tall and approximately 30 to 32 centimeters wide. 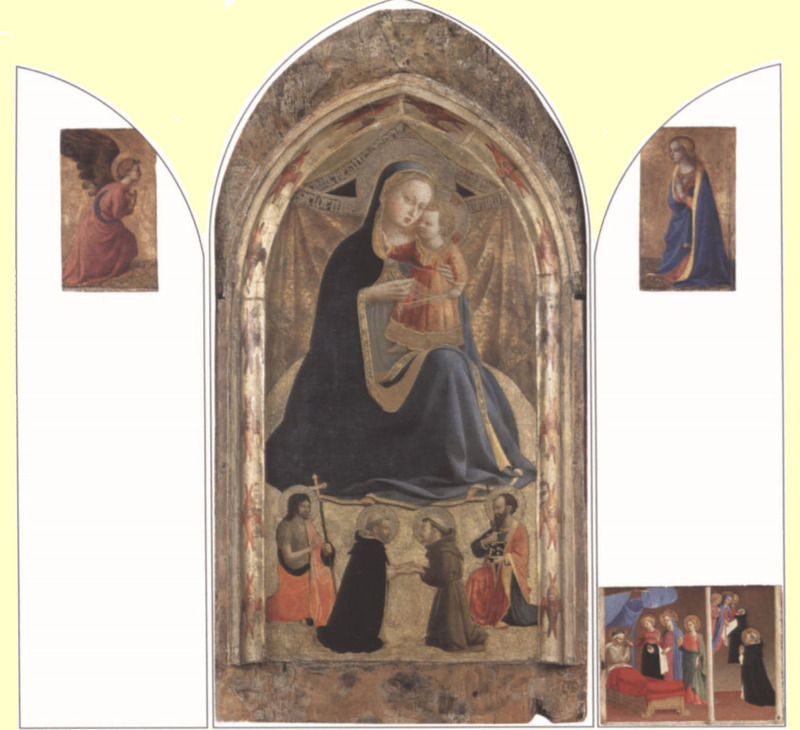 These dimensions correspond neatly with the width of the London Vision of the Dominican Habit, which has white framing bands painted along its left and right margins precisely like that along the bottom of each panel in Munich. Unfortunately, the Munich panels have been thinned to a depth of one centimeter, and thus have lost the painted decoration on their reverse sides that could have demonstrated their association with the London panel (which measures 2.4 centimeters in depth). As they exactly match the style of the London Vision of the Dominican Habit, however, the conclusion that all three are fragments of the wings of a single folding triptych is inescapable. 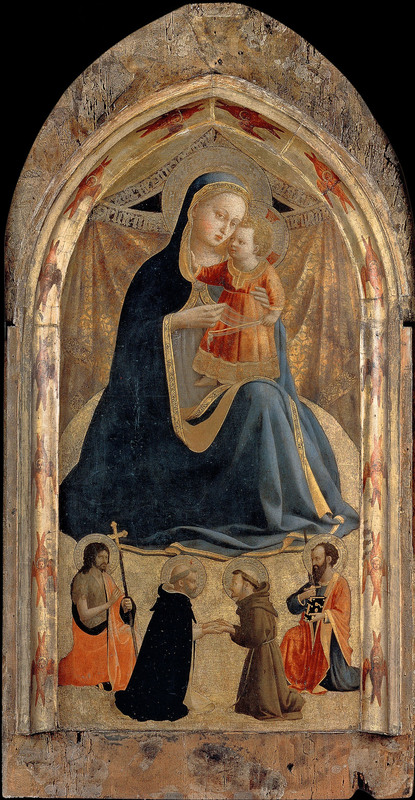 The small scene of the meeting of Saints Dominic and Francis painted in the "foreground" beneath the seated Virgin in the Parma picture establishes an iconographic link with the London panel. Finally, only the Parma panel is of an appropriate height to have accommodated the likeliest reconstruction of the London and Munich wings. Two scenes the size of the London Vision of the Dominican Habit and an Annunciation pinnacle atop each wing would have resulted in an unusually squat format: approximately 87 to 90 by 60 centimeters for the central panel, while three scenes and a pinnacle on either side would have extended the overall height to approximately 110 to 115 centimeters. The area of the Parma Virgin of Humility including the flat, top edge of its projecting surround painted with cherubim and the (missing) sloped ledge that must have completed the bottom of the tabernacle (fig. 63), and over which the wings would have folded,(*8) measures 111 to 112 by 59.5 centimeters. Although it has come down to us diminished by the fragmentation of its wings and by the loss of its frame and of some of the glazes on its painted surface, the Parma tabernacle was clearly once an object of great distinction. 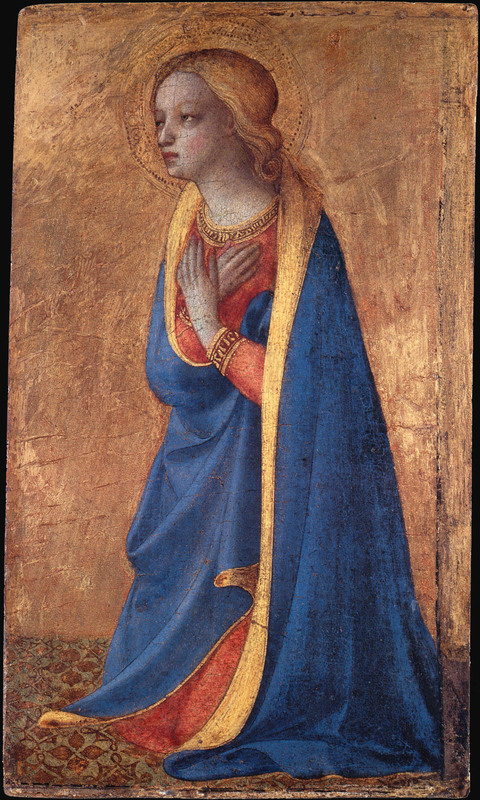 Its format is a legacy from the Late Gothic world in which Angelico was trained, but its composition introduces several novelties of spatial structure that break decidedly from the archaic conventions of such related paintings as Lorenzo Monaco's Virgin of Humility in the Brooklyn Museum, painted scarcely more than five years earlier. The pyramidal volume of the Virgin's form and the carefully articulated foreshortening of the pillow on which she sits (now barely visible as a result of the abrasion of modeling glazes over the gold leaf) establish a niche-like excavation that is closed at the back by a beautifully rendered gold cloth of honor. Kneeling in the foreground against what now reads as a flat plane of gold — but which originally must have been modulated for an effect of spatial recession no less convincing than the marvelous patterned floors on which the Munich Annunciatory Angel and Virgin Annunciate kneel — are small figures of Saints John the Baptist, Dominic, Francis, and Paul. Dominic and Francis enact the scene of their meeting, obscuring the conceptual boundaries between their presence here as iconic attendants of the Virgin and their roles in the sequence of surrounding narratives that once appeared on the wings of the tabernacle. John the Baptist and Paul kneel at a measurable remove behind them, as though witnessing their meeting; they are smaller in scale, precisely calibrated to reinforce the impression of their distance from the frontal plane. Almost in defiance of the conventions imposed upon him — including the use of gilding, which so often he turned to brilliant advantage — Angelico painted the attributes of John the Baptist (a cross) and Paul (a sword), so that they seem to tilt backward in space and thus to disappear behind the golden radiance of the saints' halos. When completed by its narrative wings, the Parma tabernacle would certainly have been an auspicious precursor of the great tabernacle commissioned by the guild of the Linaiuoli in 1433 (see cat. 29), and also, to the best of our knowledge, the first extended cycle of scenes from the life of Saint Dominic painted by Angelico, predating the Birth of Saint Dominic and the Vision of the Dominican Habit on the pilaster bases of the Cortona Annunciation, and the slightly later predella of the Louvre altarpiece. It is unfortunate that the original patron of such a distinguished painting has not yet been determined. While all the surviving fragments share a Florentine provenance, they provide no further clues to the origins of the tabernacle other than that perhaps the Parma Virgin of Humility was acquired by the Marchese Alfonso Taccoli Canacci in 1786 in the wake of the Leopoldine suppressions of Florentine confraternities. If it were a confraternal rather than a private commission, the presence of Saints John and Paul in the center panel, in the context of what is otherwise a paean to Saint Dominic and his order, might hold a significance beyond a reference to a donor's name and patronymic. A suggestion(*9) that the inclusion of Saint Paul might refer to the Florentine Ospedale di San Paolo, situated in the piazza of Santa Maria Novella, merits further investigation. (*1). Gordon 2003, p. 32. (*2). See Warr 2002, p. 56; Cannon 1998, pp. 27-28. (*3). Gordon 2003, p. 32. (*4). Levi D'Ancona 1970, p. 29; Salmi 1958, p. r to; Pope-Hennessy 1974, p. 228. (*5). Bonsanti 1998, p. 14t; Baldini 197o, no. 55, p. 98. (*6). L. Collobi-Ragghianti (1955b, p. 40) associated the National Gallery Vision of the Dominican Habit with a panel of The Miracle the Book, formerly in the collection of Sir Thomas Barlow (see cat. 37), identifying them as the predella to the Coronation if the Virgin altarpiece in the Uffizi. M. Salmi (1958, p. t to) suggested that The Vision ry" the Dominican Habit was painted for the predella of the Croce al Tempio Lamentation altarpiece of 1436-41. (*7). A. Galli, in Fornari Schianchi 1997, pp. 67-68;A. Galli, in Di Lorenzo 2001, pp. 28-29. (*8). The area of exposed wood at the bottom of the panel is too narrow to have accommodated a conventional predella, painted or otherwise, capped by moldings at the top and bottom proportionate to the remainder of the tabernacle's frame. It is probable, instead, that this area was covered by a straight, sloping molding, which completed the ring of projecting decoration that surrounds the rest of the painting, on the model of Bartolomeo Bulgarini's tabernacle now in the Isabella Stewart Gardner Museum, Boston, which originally was enclosed by folding wings (now in the John G. Johnson Collection, Philadelphia Museum of Art).The flat, gilded top edge of the projecting molding of the Parma panel is meaningless as an architectural form unless it was intended as the surface against which the painted wings rested when closed.The gilding at the top is two centimeters wide and preserves a barb along the back edge, which extends around the full perimeter of the panel. Outside this barb is 1.8 centimeters of exposed wood on the flat, top edge, and 1.8 centimeters of exposed wood of the backing board beyond the raised molding. Cut-off nails in this area and fragmentary wood fibers still glued to the outer edge of the raised molding indicate that these exposed areas originally supported additional moldings that contained the entire tabernacle within a sort of box-like enclosure to which the wings were hinged and inside which they folded flush when closed. An intact example of such a structure painted by Agnolo Gaddi is preserved in the Museo del Opera del Duomo in Perugia. (*9). The proposal was made by Aldo Galli, in an oral communication, 2002.